SDS Right-to-Know Metal Cabinet stores your SDS information with ease. Durable metal cabinets allow you to safely store SDS information on any wall. 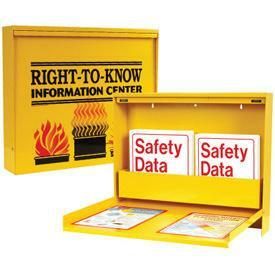 Keep safety data sheets organized and in one place with this convenient right-to-know center. It mounts easily to a wall to create a handy desktop and reading source. SDS cabinets are great for indoor or outdoor storage. Certifications: Complies with HCS/GHS 2012.